Hello Friends! 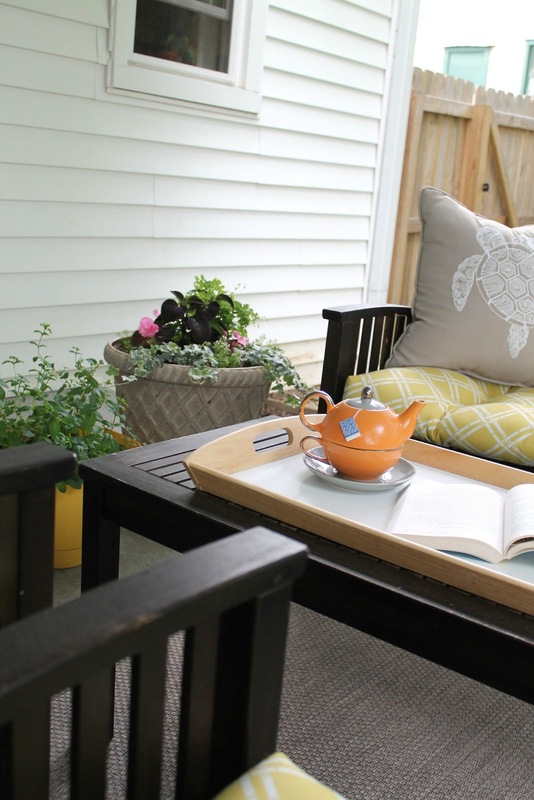 I have been participating in an Outdoor Extravaganza link party co-hosted by Our Fifth House. This weeks installment is Decorating. I thought it was high time I shared with you my outdoor curtains I hung around my back porch. 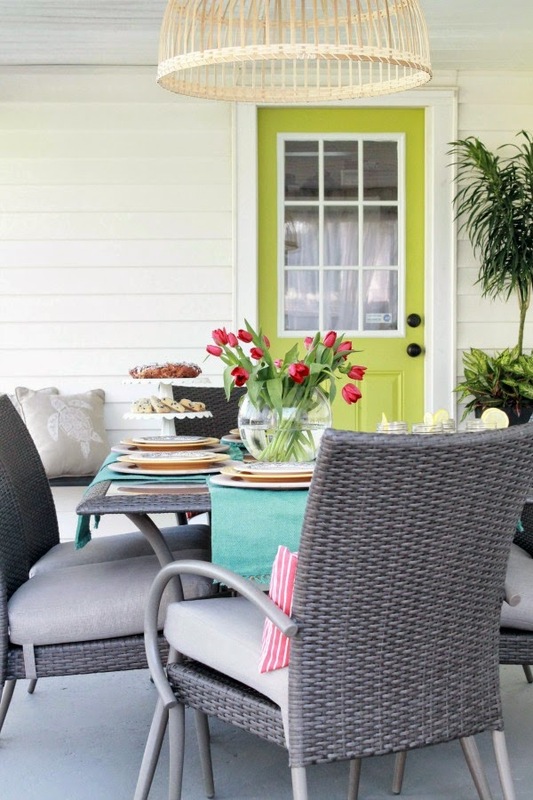 It brings the indoors out and adds a layer of sophistication to the porch. I just adore my curtains! They are so perfect in the space. I love when a breeze comes through and the curtains sway in the wind. My porch is a place for me to relax in the mornings before the heat sets in. I can have a cup of tea and catch up on some reading or I can sit with my bambini and have a glass of lemonade. Lemonade and sweet tea are my go to drinks for warmer weather. 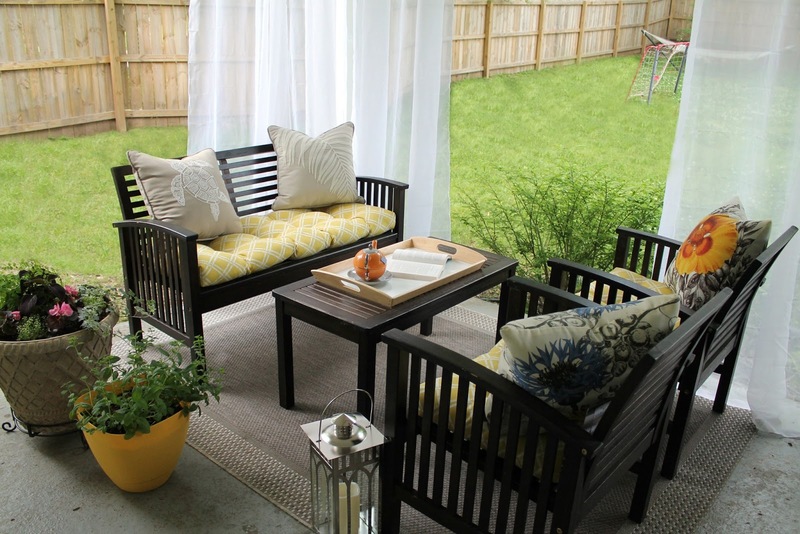 I purchased my outdoor curtains an year ago and I am happy with my decision on sheers. They don't provide privacy but we aren't in need of privacy. They are aesthetically pleasing and soften the edges of the porch. I purchased only 4 panels and quickly realized I need at least 4 more in the near future. I have accomplished all that I wanted to do for my back porch this year. I still have a couple of items to complete before the space is completely done but for now I will draw my attention elsewhere. 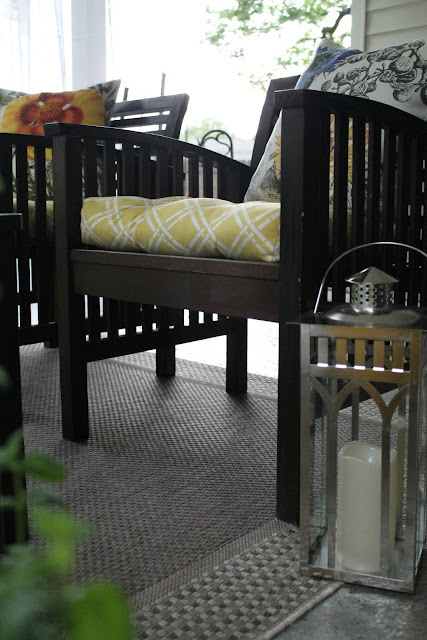 The outdoor rug we chose is holding up nicely in the elements and I am loving our vibrate cushions and pillows we added to our existing patio furniture. I shared with you last week my 'made for the shade planter' that is loaded with colorful plants and flowers. The space is nearly complete, here is whats left to-do. Tell me what you think about our back porch and our outdoor curtains. Next week I will show you how I created my curtain rods that was less than $10! See ya soon! This is oh so pretty, Darnetha! And so inviting! 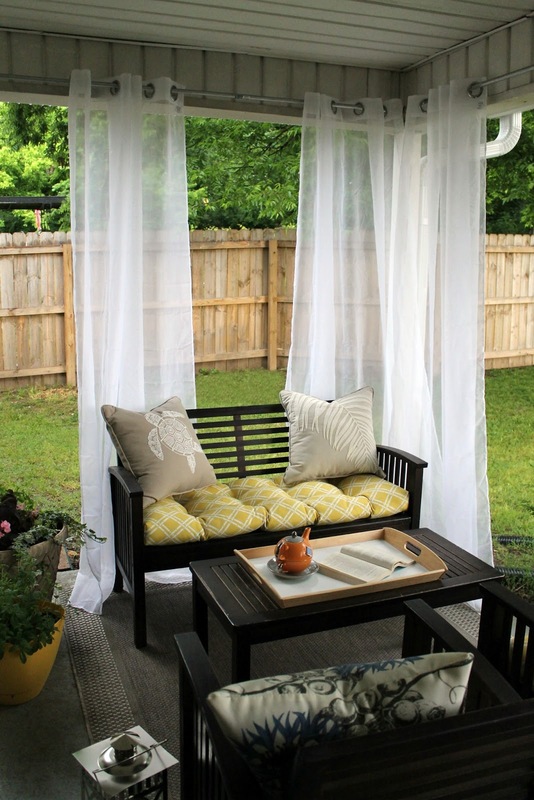 The outdoor curtains add a special something to the look! I know you're very proud on how your porch came together! Great job! 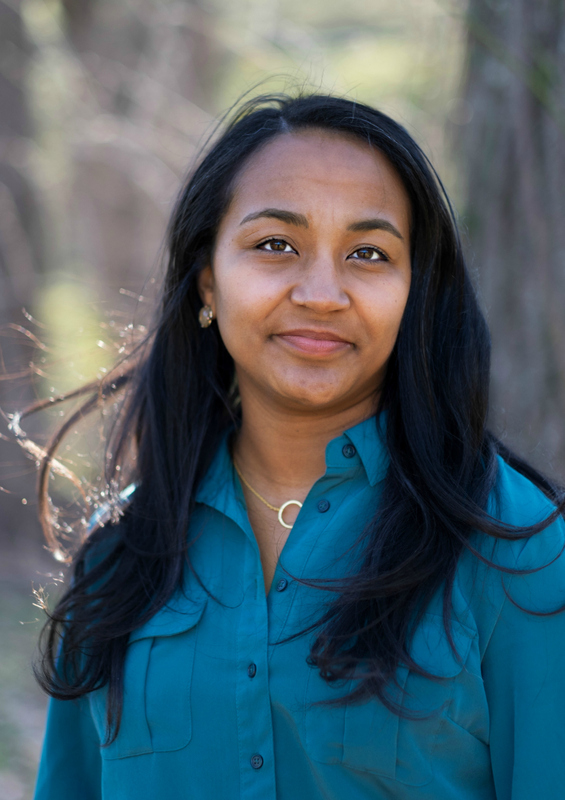 It is beautiful, Darnetha! I love it all. 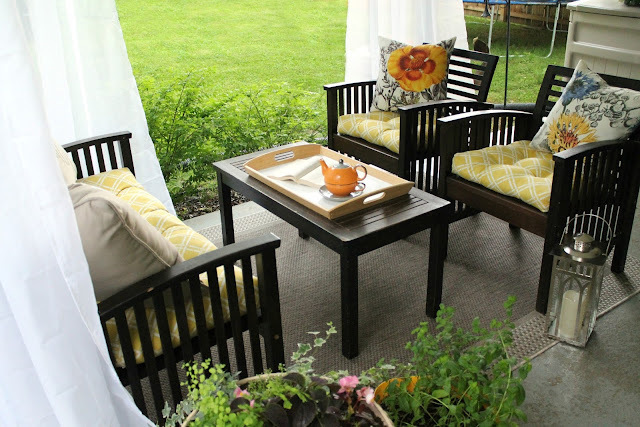 Your backyard looks so inviting and a great space to hang out and enjoy the summer. Adding the sheers was a brilliant idea. How could you tell?! Lol! 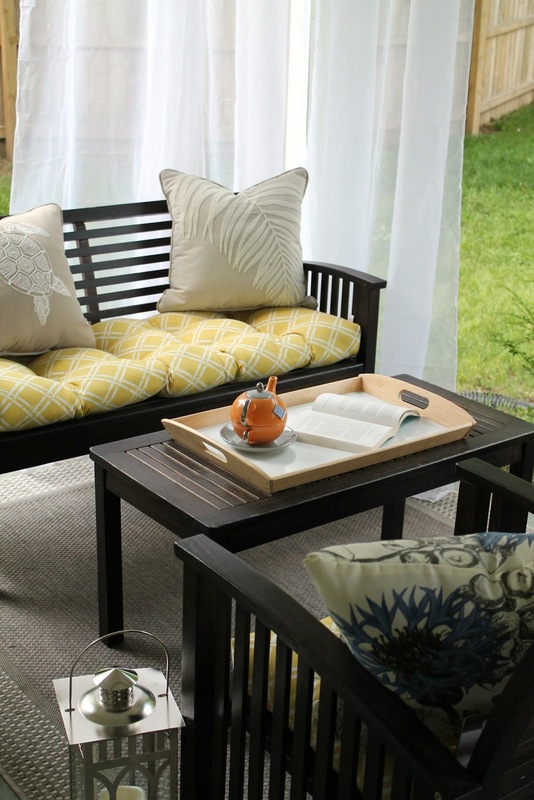 I will definitely check out your summer living room! I just loved your outdoor space and that movie projector is a great idea. A Memorial Day cookout is a great idea! Well done! It looks like such a happy place. It looks wonderful! Love the curtains too amd looks like you have a lot of shade there. This looks so peaceful! I love your curtains, I hope to get mine up very soon. Thanks for linking up!